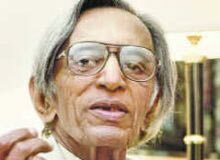 Tyeb Mehta was born on 26th July 1925 in the Kapadvanj city of Gujarat. In the initial years of his career, he worked as a film editor in a cinema laboratory. However, soon, his interest in painting led him to leave that line of career. He came to Mumbai and joined the Sir J.J. School of Art. He studied at the school for five years, from 1947 to 1952. There, he came into contact with Akbar Padamsee and joined the Progressive Artist's Group. In the year 1954, Tyeb Mehta went to London and Paris for four months and then returned to India. Thereafter, he started participating in group-exhibitions on a regular basis. His first solo exhibition of drawings, paintings and sculptures was organized at the Jehangir Art Gallery of Bombay (now Mumbai), in 1959. Tyeb Mehta moved to London in 1959 and worked there till 1965. In 1965, he came back to his home country and started living in Delhi. Tyeb received Rockefeller Fellowship in 1968 and went to U.S.A for a few years. Thereafter, he started experimenting in films also. In the 1980s, he worked as 'Artist in Residence' in Shantiniketan. Tyeb Mehta participated in a number of international exhibitions, including 'Ten Contemporary Indian Painters' at Trenton in U.S.A.; 'Deuxieme Biennial Internationale de Menton', 'Festival Intemationale de la Peinture' and Cagnes-Sur-Mer in France; 'Modem Indian Paintings' at Hirschhom Museum of Washington and 'Seven Indian Painters' at Gallerie Le Monde de U art of Paris. One of the paintings of Tyeb Mehta holds the record for being the highest priced Indian painting. In December 2005, his painting 'Gesture' was sold for 31 million Indian rupees at the Osian's auction. His film 'Koodal' won the Filmfare Critic's Award in 1970. Tyeb Mehta was awarded the 'Kalidas Samman' by the Government of Madhya Pradesh in 1988.